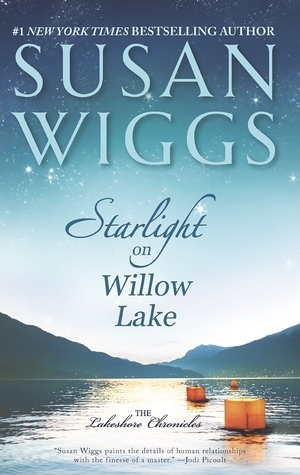 We've reached #11 in the Lakeshore Chronicles by Susan Wiggs with Starlight on Willow Lake. I've enjoyed every one of them, including this one. I've tended to think of this series as contemporary romance, but Starlight I think falls more into the women's fiction realm, as the emphasis is on the growth of two women and two girls. Yes there is some heartwarming romance, but its not centre stage. Faith is in her mid-thirties, she is a struggling widow with two girls, Cara a teen and Ruby a second grader with diabetes. At a crucial time, Faith lands a job with Alice Bellamy in her beautiful house beside Willow Lake in Avalon. Alice is a quadriplegic and Faith is a nurse. Faith is the right person for Alice, she is a straight talking, perceptive carer who will trigger many a ripple in the Bellamy household. Alice's sharp commands are ably countered by Faith, her experience and ability not to get hooked by Alice's anger and dejection are just what Alice needs. Good review! I've read 2 or 3 of the early Lakeshore books but for some reason didn't continue, but not for lack of interest. I do enjoy Susan Wiggs when I get a chance to pick up her books. I'm glad you stuck with the series and are still enjoying it! Thanks Rita. I love Susan Wiggs' books, especially Women's Fiction ones, but like this series. If I like a series I usually go with it to the end! Programmed! I'm so glad to see you enjoyed this one - great review!! I haven't read a Wiggs book in a long time, but I've really enjoyed every book I've read of hers, especially this series. I'm definitely going to have to read this one. S Wiggs is always a must read for me. Sounds like a good book. I have two of her books in my to read book shelves , we will see when I actually read them!!! All in good time Viki. Lovely review ... another series I really want to start on, but first The Apple Orchard. Definitely The Apple Orchard and the next one as well. Some WW11 in them! What a interesting story this sounds like. I like that it's more women fiction. I haven't read any of the other books in this series, so I'm glad to hear it works as a standalone. It does, at the beginning of the series they were pretty much romance alone, but as the series developed it became richer. Ok, I'm adding this to my TBR list. I read most of the previous books in the series but not the last 2 or 3. Maybe I'll just skip ahead because this sounds really good! Mary don't miss out Marrying Daisy Bellamy if you've read a good part of the rest of the series! Even better than this one. Glad you enjoyed this Kathryn. It's good to know that it can be read as a stand alone. I read a few books in this series. This one sounds really good. The later ones were the best ones in my opinion. Kathyrn, this is my all time favorite contemporary series. I've impatiently awaited each and every tale. This one is on my tbr pile but I don't remember Alice, have we met her before. Plus if you read some of her women's fiction you'll find she cameos some of those characters in her Willow Lake series too. Debbie I've read them all and the one I waited for was Marrying Daisy Bellamy and it is hands down my favourite! As far as I can remember back Alice has not been mentioned before. This is very much a standalone from the rest of the series. A branch of the Bellamy family, so the others hardly get a mention. I've been looking at this one, but was kind of shying away from it once I found it was part of a series. Maybe I'll give it a shot, or try to read the one previous and then this one. There are too many for me to get through the whole series.